This turntable comes with our Interspace tonearm. Built onto a 50mm ‘ingot’ style chassis it has a 27mm alloy platter with a black acetal bearing which contains two internal bushes, this aids with the bearing oil circulation and adds stability, creating a lovely smooth running platter. Textured black finish ( colour options and / or gloss finish at extra cost ). SPACEDECK: One of our most popular turntables. The 37mm platter is mounted onto its own chassis and runs on our classic bronze bearing. The motor/pulley assembly is mounted in its own housing which sits separately from the turntable chassis, the only connection is the drive belt, this helps to avoid audio resonances being transferred through the chassis of the turntable. Upgrade options available are: Second arm mount for left side, HD (heavy duty) upgrade kit comprising of the 25mm graphite ‘mat’. High gloss black finish (colour options at extra cost). Looks exactly like the Spacedeck but has a few hidden extra features. The bronze bearing has the carbide/bushed type internal workings, the motor housing and armbase are manufactured from a heavy dense steel. All these features add greater stability to the turntable. Upgrade and colour options are the same as for the Spacedeck. 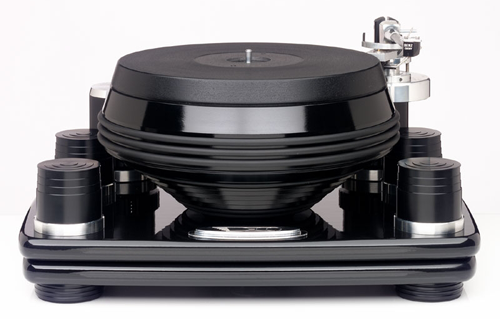 This turntable has a 58mm alloy platter with a 25mm graphite ‘mat’ and is mounted on its own chassis. The smooth running carbide / bushed bronze bearing allows the bearing oil to keep a constant, even flow around the spindle shaft. The motor housing is divorced from the chassis, (as the Spacedeck) and can accommodate a second tonearm if required. High gloss black finish (colour options at extra cost). This lovely turntable has been designed to accommodate 12” tonearms only. Based along the same lines as the Ace Spacedeck turntable, it has a 14” diameter alloy platter which allows the resonances to disperse efficiently and give a wonderful open sound. 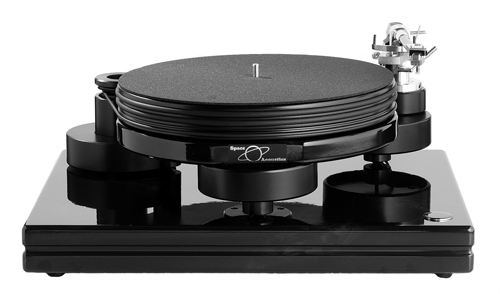 The turntable can be upgraded with the 14” HD (heavy duty) upgrade kit and has a second tonearm option if required. High gloss black finish (colour options available at extra cost). One of our bestselling turntables, the Dais has a 20+ kg gravity spun cast iron platter topped with the graphite ‘mat’. The bronze bearing has the carbide/thrust design which allows the continuous flow of bearing oil between the spindle shaft and bearing, this, along with the special grade stainless steel spindle housing give great stability and is a wonderful platform for the vinyl record. Can accommodate up to two tonearms (9”, 10” or 12”). The Dais comes as standard with its own power supply. Platter colour, black or silver, base colour black gloss. (Colour options available at extra cost). One of our favourite turntables. The lovely wooden chassis (or ‘log’) is made from either Sapele or aged Oak. Each ‘log’ is made by joining sections of the timber in a rotational fashion allowing the audio frequencies to disperse away from the platter, once the ‘log’ is machined and dressed it is allowed to season, only then is it ready to be made into the ‘AnnaLog’. 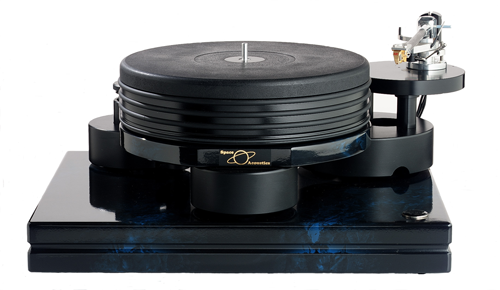 The platter, bearing and spindle assembly is the same as on the Dais turntable and also comes as standard with its own power supply. The AnnaLog can accommodate two tonearms if required. Black gloss finish for the platter and base with colour options available at extra cost. A turntable built for the vinyl enthusiast – not only does it look a little different but has the ’wow’ factor when you listen to the music. It takes some getting used to as the detail that comes from the vinyl can be slightly overwheming at first. The heavy alloy / graphite platter design is stepped and tapered which gives this turntable amazing ability to control and disperse the audio resonances. The Deco has an adjustable layered base plinth which gives wonderful damping qualities and allows the user to create his/her own prefered sound. Comes as standard with its own power supply. Platter and base finish, high black gloss with colour options available at extra cost. Made from 25mm thick carbon graphite, these kits are disigned as an upgrade for the Spacedeck, Ace Spacedeck and the Space 294 turntables. The kits come complete with a tonearm spacer, spindle extension and extra damping ring. These kits add extra damping qualities and stability to the turntable.